At only a few inches long and with no distinguishing external physical features to speak of, Scutisorex somereni, better known as the Hero or Armoured Shrew, is seemingly an unremarkable creature. That is, until you accidentally step on one. You see, the Hero shrew can comfortably survive being stood on by a typical adult human without any injury. The secret to this remarkably skill lies in the shrew’s skeletal system, or more specifically, its spine. Unlike almost every other mammal on Earth, with one notable exception which we’ll get to in a moment, the Hero shrew’s spine features intricate interlocking vertebrae, a very large number of spinal processes, and is incredibly thick relative to its size (accounting for roughly 4% of its total body weight, or about a 6-8 times higher percentage than mammals of comparable size). 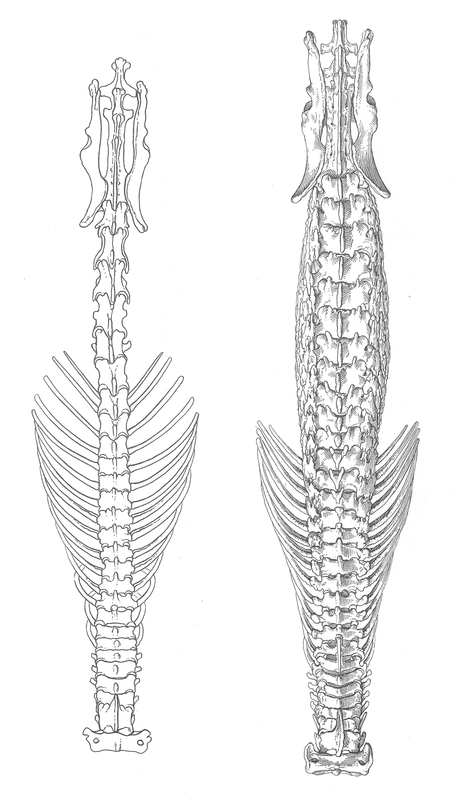 As a final insult to other, lesser shrews, the Hero shrew’s spine also contains more than twice as many lumbar vertebrae (10-11 instead of 5) giving the little guy significantly more flexibility than its peers, allowing the Hero shrew to turn around in much tighter quarters than its brethren can. 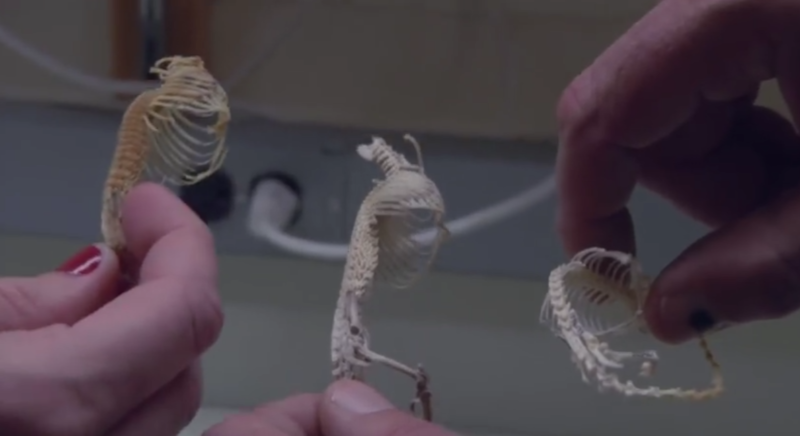 What makes this adaptation even more unusual is that most of the rest of the Hero shrew’s skeleton, aside from slightly beefier ribs, doesn’t follow suit and is not all that different to that of other small mammals. Whenever [the Mangbetu] have a chance, they take great delight in showing to the easily fascinated crowd its extraordinary resistance to weight and pressure. After the usual hubbub of various invocations, a full-grown man weighing some 160 pounds (72 kg) steps barefooted upon the shrew. Steadily trying to balance himself upon one leg, he continues to vociferate several minutes. The poor creature seems certainly to be doomed. But as soon as his tormentor jumps off, the shrew, after a few shivering movements, tries to escape, none the worse for this mad experience and apparently in no need of the wild applause and exhortations from the throng. For reference, the man in this story weighed around 1,000 times more than a typical Hero shrew. This would be like having a Boeing 757 balanced on top of a typical adult male, if humans could perform the same feat, scaled up. Although the Mangbetu have known about the Hero shrew’s remarkable resilience to pressure for centuries, when British zoologist, Oldfield Thomas became the first western expert to encounter one back in 1910, he didn’t notice that there was anything unusual about it. In fact, Oldfield described the creature as being rather uninteresting, only noting that it was slightly larger than an average shrew and had quite dense fur. 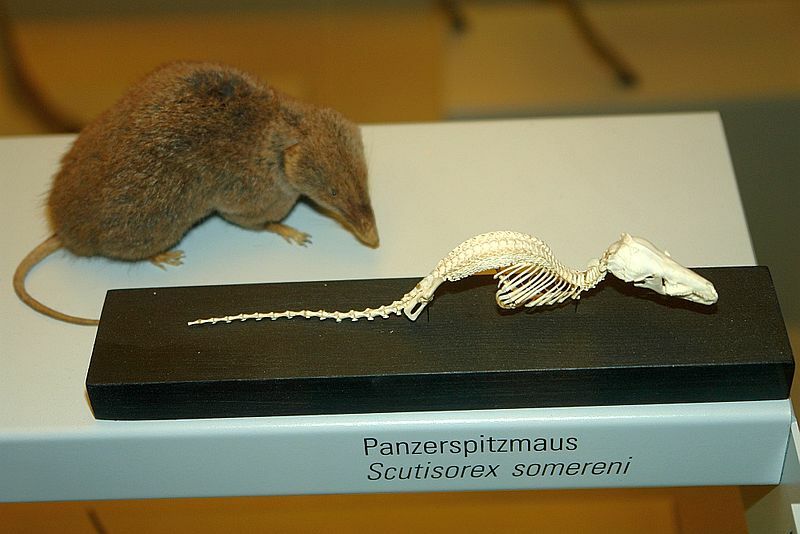 The shrew’s remarkable spine wasn’t observed by academics for another seven years, when a curator at the Natural History Museum stumbled across a preserved specimen and wrote a paper about it called, “The skeletal characters of Scutisorex Thomas“. Since its discovery until very recently, experts were baffled about exactly why the Hero shrew evolved in the way that it did, with there being no obvious explanation for why its spine needs (or needed) to be as strong as it is. There was also more or less a “missing link” between the spines of a typical shrew and the exceptionally different spine of the Hero shrew. This latter point was initially explained by perhaps being an example of punctuated equilibrium, a theory that posits that under just the right circumstances, a subset of some members of a species can evolve rapidly in response to a threat or change in environment while the rest of the species that aren’t experiencing these same environmental pressures may stay more or less the same. Once the rapidly evolving group adapts to the environmental pressures, it also more or less stays the same in this new form, with the rapid scale and isolation of the event leaving little record of the transition. However, quite recently the potential “missing link” was found. In 2012, William Stanley and his team, acting on behalf of the Field Museum of Natural History in Chicago, encountered a close relative of this remarkable shrew species in a small African village in the Democratic Republic of Congo. Like the Hero shrew, this new species, named the Scutisorex thori, sported an unusually thick spine consisting of interlocking vertebrae. Unlike the Hero shrew, though, this new species had only 8 lumbar vertebrate, 3 more than regular shrews, but 3 less than the Hero shrew. 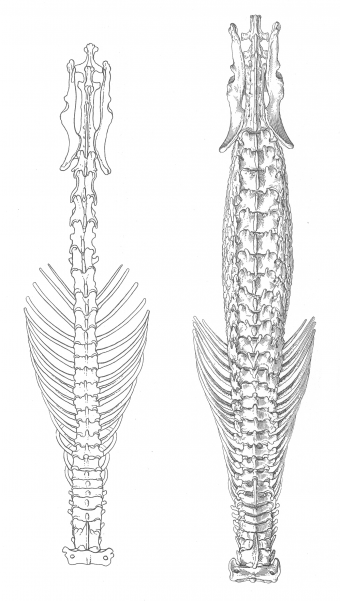 It also had fewer and bigger spinal processes, a little more like a typical mammalian spine. Essentially, this spine is more or less half way between a Hero shrew’s and a typical shrew in form. After analysing the new species of shrew’s DNA, the researchers found that, indeed, they are closely related to the Hero shrew. As to the question of why such an evolution would have taken place, during his time in the Congo, Stanley was told by locals that the best place to find Hero shrews was in swampy palm forests, where beetle larvae and other such creatures can often be found under dead palm leaves, branches, and the like. After watching the natives pry up such things to expose large grubs for harvesting, he logically theorised that the reason this new shrew, and by extension its sister species, had evolved such strong backs and spinal muscles (as well as thicker ribs) was because it allowed them to pry up branches and other such objects enough to expose the grubs the shrew like to eat, all without risking injury. This gives these shrews a significant biological advantage over other shrews in certain regions. However, according to Stanley “no one has seen the shrew actually do this”, so it remains just a very reasonable sounding theory without hard evidence to back it up. William Stanley dubbed the new species of shrew he discovered, Scutisorex thori or Thor’s hero shrew. While the international media reported that Stanley chose this name as a nod to the Norse god of strength and thunder. The name is actually a tribute to Thorvald Holmes, the collections manager at Humboldt State University Vertebrae Museum, a man Stanley claims kick started his career and interest in mammals in the first place. Though Stanley noted that the name “invokes Thor, the god of strength in Norse mythology”, the idea that it is named in honor of him just isn’t true. The name Hero shrew was first coined by the Mangbetu, who gave it this name for obvious reasons. While Thor’s hero shrew and the Hero shrew do share a lot in common, the two species differ in a number of ways. The most notable difference is the fur, which on Thor’s hero shrew is notably shorter with a more silky feel. The Hero shrew by comparison is noted as feeling “woolly”. The Mangbetu reportedly have a deep affinity for the Hero shrew and believe that its hardiness is evidence of magical powers. So much so, that Mangbetu warriors would often wear small talismans made from pieces of the creature’s body, usually its heart in the hope that doing so would transfer some of the shrew’s powers to themselves. In a similar vein, medicine made from Hero shrew bones was also believed to be able to make the drinker more immune to the damaging effects of spears and arrows or protect them from getting trampled by an elephant when on an elephant hunt, or the like. I hv often stepped on moles in my yard barefoot, only to realize HEY something is moving beneath my foot and its furry…that’s when I discovered that moles also could withstand the weight of a humans step. I would assume they hv a similar spinal cord structure? That’s very interesting. I would not have thought that a mole could take the full weight of a human balancing on it on one foot. You must be very light. How much do you weigh ?